Pioneers in the industry, we offer donor couch, blood donor couch, portable blood donor couch and microcontroller based donor couch from India. We are engaged in offering Donor Couch, which is a completely upholstered donor chair designed to provide comfort and safety to the donors. These couches come with metal frame construction and power slide control to enable smooth shifting of positions. 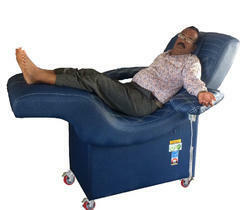 Owing to their high adjust ability, comfort level and accurate designs, these donor couches are in high demand. Size 1828 mm X 609mm X 660 mm. We bring forth Blood Donor Couch which is based on hemodynamic principle. Offered couches enable a comfortable position for the donor and offer facility for blood collection for both sides. Comfortable arm rests and two geared actuators provided with these couches provide maximum level of relaxation to the donor. Our clients can avail these efficient and safe couches at affordable rates. We are engaged in providing Portable Blood Donor Couch which find application in blood banks, hospital clinics, and plasma centers. These motorized chairs are extremely popular because of their robust construction, adjustability and high level of comfort. Our clients can avail these uniquely designed and easily operable chairs at market leading rates. We offer wide range of Microcontroller Based Donor Couch to our valuable client. 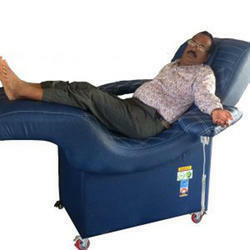 All these couches are widely used in hospitals and blood donation camps. Donor's position can be easily shifted from upright body position. To make blood withdrawal easier, safe and functional, these are specially designed. Looking for “Blood Donor Couch”?